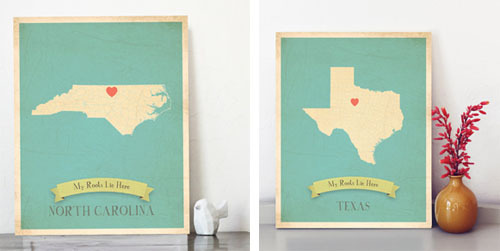 Rebecca offers prints for all 50 states in various color combinations. She creates each one with New Leaf recycled card stock and soy ink, packaging all her art with biodegradable materials. Another artist that caught my eye this week is Amy Nelson, who offers 71 versions of her city and state art. She adds heart icons for the cities featured.